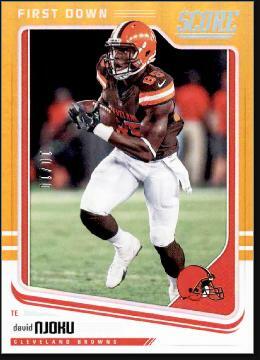 David Njoku was born July 10, 1996 in Cedar Grove. His parents has were recent immigrants from Nigeria. David was the sixth of 10 children. His father was in the energy business and his mother owned a clothing store. In youth sports, David demonstrated exceptional speed and jumping ability, and initially gravitated toward track and field. He also began playing football in seventh grade. By the time he graduated from Cedar Grove High School, David stood 6–4 and was the 2014 state high jump champion, clearing 7’1”. He then went on to win the national title with a jump of 6’11”. David earned a scholarship to the University Miami, where it was understood he could continue as a two-sport star. He saw limited action for the Hurricanes football squad as a freshman, focusing more on bulking up his ling frame. In the spring of 2015 he suffered a sports injury but still competed in the ACC Indoor Championships. In 2016, David raised his weight to 240 pounds and showed great improvement in his blocking skills. He worked with former Miami tight end Kellen Winslow Jr. on the finer points of the game. 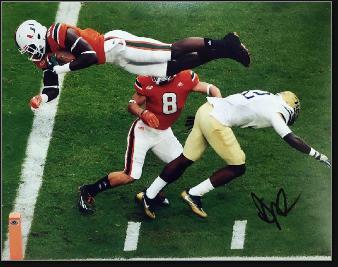 David played in 13 games for the ’Canes and caught 21 passes. In 2017, he took his game up a notch, combining his athleticism with his toughness and talent to reel in 43 passes. Miami went 8–5 and 9–4 in those two seasons, earning bowl berths both times. David decided to declare for the draft in 2017. His final game was a 31–14 win over Top 15 ranked West Virginia in the Russell Athletic Bowl. With Miami holding a 217 lead in the third quarter, David caught a 23-yard touchdown pass. Quarterback Brad Kaaya was the game’s MVP. He caught a pair of passes in his NFL debut against Pittsburgh, and snagged his first TD pass a week later against the Ravens. Cleveland suffered through a humiliating 0–16 season. David split starts with Princeton star Seth Devalve and finished the year with third on the team with 32 receptions and led all receivers with 4 touchdowns. Even so, David’s 30+ catches and 300+ yards as a 21-year-old rookie put him in fast company; only Tony Gonzalez, Jason Witten and Rob Gronkowski had done that before him. Brimming with young talent, the Browns looked to make 2018 the year they turned things around. They were 2–6–1 heading into Week 10 but had played well in all but one of their losses. Gregg Williams replaced Hue Jackson and led Cleveland to a 5–2 record over its final seven games. Rookie quarterback Baker Mayfield found his stride and ended up with 3,725 passing yards and 27 touchdowns. David caught 56 passes, finishing second behind Jarvis Landry, and scored four times. Two of those scores came in their victories over the division-rival Bengals.